Bradley is registered for the Mazda Supercup this season and this entitles him to participate in the Mazda Super Series that is run during the season. Qualifying went well with Bradley taking 7th place out of 22 fellow competitors, a great achievement considering he had no testing or practice prior to this. Race 1: Starting 7th, Bradley soon moved up the order getting into 3rd place within just 3 laps. He looked as though he would improve on this only to have a gearbox issue which forced him to retire from the race. The team sourced another gearbox from another team and changed it on Saturday afternoon ready for the 2 races on Sunday. Race 2: Due to the retirement on Saturday Bradley was forced to start 19th on the grid. After a great start he had worked his way up to 3rd place only to go off at clearways and come back on in 13th position. Bradley was setting the fastest laps and clearly showcasing his superb driving skills and eventually finished 4th at the chequered flag. Race 3: Bradley had a real chance in this race now, starting in grid position 4 and was in 3rd place soon after the start. After harassing the driver in 2nd position for a number of laps, Bradley soon reaped the rewards with the driver going off track as he was approaching clearways which allowed Bradley to move up to 2nd. 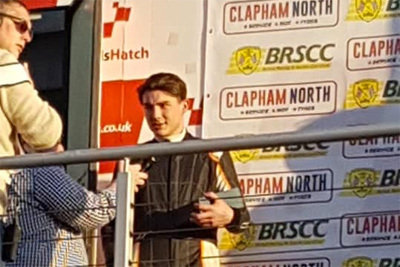 Having been held up in 3rd place for most of the race Bradley started to chase for the number one spot by setting fastest laps again and reducing a 3 second lead down to 0.2 seconds at the finish of a shortened race due to a car being in a dangerous position on paddock hill. Had the race run its full distance, we have no doubt Bradley would have won. However, to come away with 2nd place and the fastest laps in race 2 & 3 shows just what he is capable of and we have high hopes for the Supercup starting at Snetterton on Easter weekend. This entry was posted in Race Reports and tagged Brad Kent, Bradley Kent, Essex And Kent Motorsport, Mazda MX5 Super Series. Bookmark the permalink.